Michael Segalov reports for Ceasefire on today's sit-in protest by three hundred workers against a ‘pay modernisation’ scheme by Green Party-run Brighton and Hove City Council. 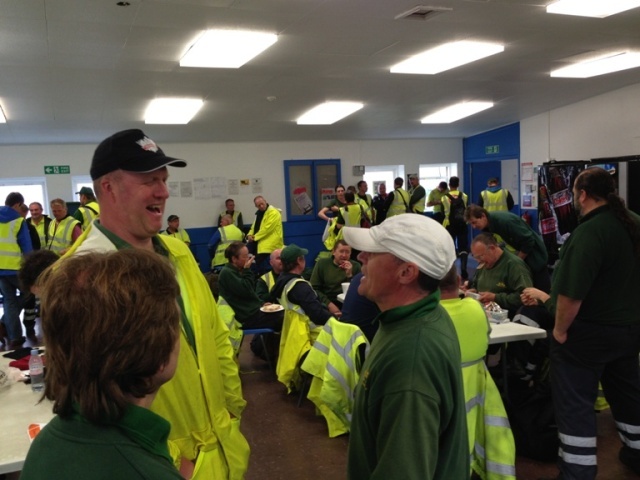 Three hundred bin men (and women), street cleaners, recycling staff and more, backed by their GMB union reps, refused to leave their depot today after a meeting with management in which the final details of Brighton and Hove City Council’s ‘pay modernisation’ scheme were outlined. The scheme, which applies to the 8,000-strong workforce of Brighton and Hove City Council, could mean that refuse and recycling staff at Hollingdean depot lose up to £4,000 a year. Today’s sitting-in workers are demanding that the assault on pay is scrapped. They will not ‘even consider working’ until Council Leader Jason Kitcat and the Chief Exec address them in the depot. Today’s refusal to work comes after months of negotiation and consultation between the council and the GMB union during which, GMB branch rep Holly Smith states, council management ‘haven’t budged.’ Instead the consultation process has apparently resulted in claims from the council that they will sack all staff facing the proposed changes and re-employ them ‘on a worse contract, without compensation’ if staff refuse to accept the new terms. There was also dismay amongst staff that the council, a recently accredited living wage employer, would not keep this commitment to its staff. A spokesperson from the council insisted that while the outlined proposals announced yesterday represented the final proposition, it is ‘not complete.’ ‘While it’s not going to change a huge amount, there would be tweaks.’ With an indefinite walk-out on the cards and support from Union officials, it is clear that these tweaks would need to be considerable and significant to convince workers. GMB suggest anyone wishing to express their concerns to the City’s councillors visit the GMB Southern website, and fill in the petition against cuts. Every time this is filled in an email goes directly to all councillor’s inboxes. UPDATE 2pm – Penny Thompson, Chief Executive of Brighton and Hove City Council, this afternoon went to speak to the staff sitting in. Upon her leaving, a unanimous decision was taken by all those walking out to continue the occupation tomorrow. Michael Segalov is currently studying at the University of Sussex, and is part of the Sussex Against Privatisation Campaign. Hello, this is Earth (that Green place) calling Greens, do you read me? Whatever can you be thinking? Are you *trying* to commit political suicide? If so, could you kindly not do it as Greens? With concern, a Green comrade from the (dis)United States. One piece of the story you’ve missed – the local Green Party has voted for a motion which instructs the council leadership to back down on this, and says the branch will support the striking workers against the council leadership. As Adam points out you seem to have ignored the fact that the local Green Party is supporting the workers, whilst as you say Caroline Lucas the Green MP for Brighton has also voiced her support for the workers and strike action. The title of this piece clearly does not convey the political reality of what is actually going on. Also it’s worth pointing out that this isn’t about ‘cuts’ to the council’s budget as such but rather a bodged attempt at equalising sexist unequal pay grades for jobs with the same pay grade. That is not to say that the workers aren’t right about the way it’s been handled and of course pay should be equalised upwards, however, this is not a cut to council spending and it is, no matter how bungled a process, clearly totally ridiculous to compare the Green Party to ‘Tory’s with Bikes’ and not conducive to building a left opposition to the Tories. As you’ll see from the article, Alex, the ‘Tories’ analogy is a direct quotation from a worker involved in this dispute, not an invention of the author. Musab yes but the choice to have it as the title was deliberate decision my the author to convey a particular message and suggests the authors agreement with that statement. Are you arguing that every statement by a striking worker is automatically the correct analysis of a situation or are suggesting that such comments are so unimportant they are not worthy critical evaluation? If the former then counterfire’s politics is going to be very confused, if the later then it is one of patronising elitism. Actually, I wrote the headline, not the author. I think it conveys an accurate sense of the article and the feelings of workers who were quoted in the article. My personal agreement is irrelevant: we publish a very wide range of (often contradictory) views; I don’t need to agree with every headline. Later this afternoon we’ll be publishing an update on this situation with more details about the Green Party’s position, so stay tuned for that. Also worth noting that this situation is not the result of a full council vote but rather a vote by the Policy and Resources Committee, on which there are 4 Green cllrs who are saying they were misled by the council leader (Jason Kitcat) as they thought that any offer would be brought back to full council. Alex, I think it is also important to note the question mark within the title. Whether I agree with the sentiment or not, a party that claims to represent the best interest of workers is being questioned and scrutinised, and it would seem strange to ignore the questions raised. As Musab has noted, developments from within the Green Party have come to light recently, and in an article I have written today this will be evident. These changes are the direct result of misguided, EU-inflicted, ‘equalities’ legislation which says that a ‘traditionally male’ occupation which doesn’t need school certificates – however arduous, like emptying bins – can never be paid more than pen-pushing. Did Caroline Lucas ever vote against that legislation during her 11 years in the European Parliament? Nope. Jacob, which EU directive please? Not sure how Greens can be lumped in with Tories as their policies are generally socialist. Shockingly one-sided article. No representation at all from the Green council or the Brighton and Hove Green party neither about the reasons for the dispute nor the rationale for their decision. I note the link above to another ceasefire article, which does put the other side. Thanks.